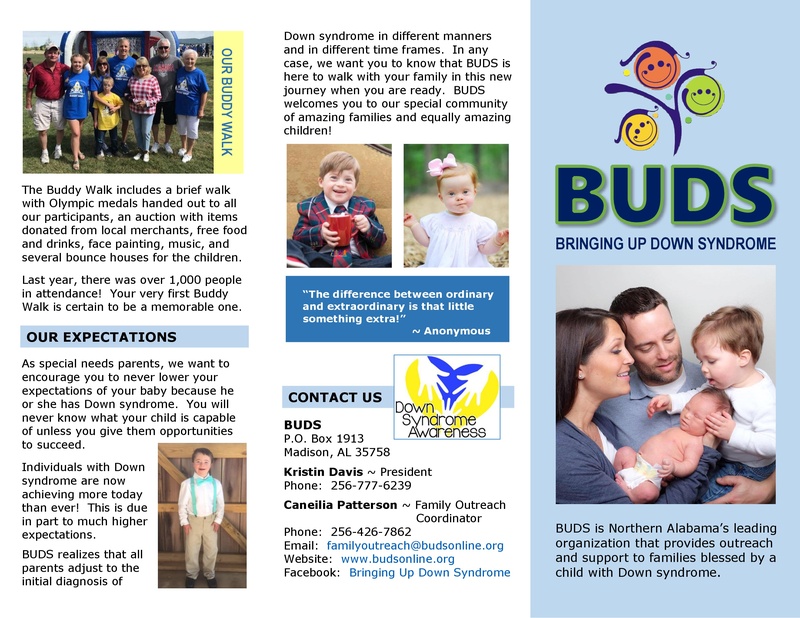 BUDS encourages any new parent in North Alabama who is facing a diagnosis of Down Syndrome to begin their journey by reading the following Family Outreach Brochure. 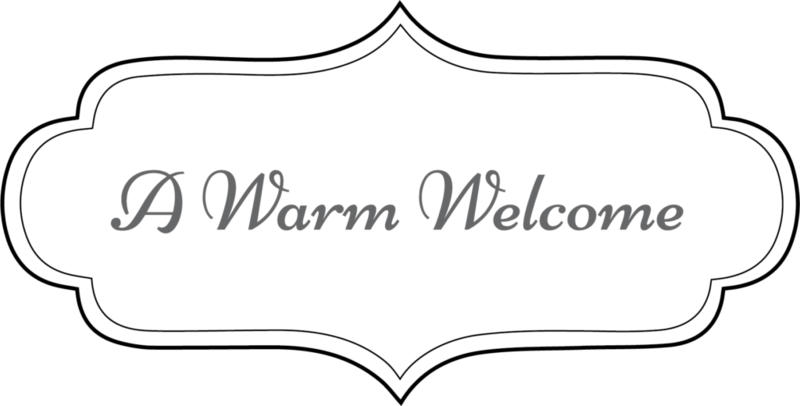 We have a “Welcome to BUDS New Family Packet” that we would love to provide you with. If you go to Join Us and fill in the appropriate information, our Family Outreach Coordinator, Caneilia Patterson, will be in contact with you shortly. Thank you so much! Congratulations on the birth, or expected birth, of your baby! We understand that your baby may have Down syndrome. You probably have a million questions, concerns and fears right now. That’s okay. The most important thing to keep in mind is that this diagnosis is not as life-changing as the fact that you have a new baby. And in most ways, your baby will be just like other infants. Every baby needs to be fed, held and most of all, loved. There will be challenges in raising your child, but there will also be many, many joys. It’s normal to be nervous about what lies ahead, but remember that Down syndrome is a condition your baby has, it is not who your baby is. Now is the time to begin learning all you can about Down syndrome and our Family Outreach Brochure is a great place to start. Down syndrome is the genetic condition resulting when a baby is born with three, rather than the usual two, copies of chromosome 21. Because there are three copies of chromosome 21, Down syndrome is also called trisomy 21. In a small percentage of cases, there is only an additional part of chromosome 21. This is called partial trisomy 21. The cause of the extra chromosome (or part) is still unknown. This extra genetic material will affect your child’s development but it is not a blueprint that determines his or her potential. Although there are physical indicators of Down syndrome in a newborn, a definitive diagnosis can only be made with a karyotype, a visual display of the chromosomes. Make sure to obtain a copy of your child’s karyotype. NDSS can also provide information on all aspects of Down syndrome. Contact us for a free New Parent Packet that contains general information, inspirational material and a list of resources for new parents. 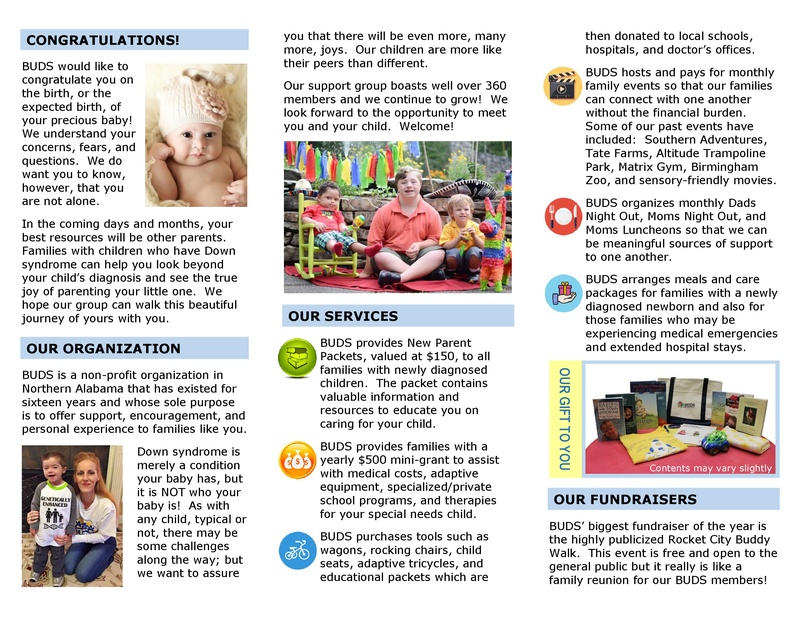 When you visit NDSS online at www.ndss.org, you can find local and national resources, connect with other parents through message boards, purchase helpful products and more. You can ensure your newborn’s optimal development through informed health care. The Health Care Guidelines for Individuals with Down Syndrome are compiled by the Down Syndrome Medical Interest Group, a national affiliation of health care providers who care for individuals with Down syndrome. The guidelines, which follow an individual’s development from birth through adulthood, will alert your primary care physician to potential health concerns for your child. For instance, during the first three months, babies should be screened for cardiac problems, cataracts and hearing loss. While the guidelines highlight areas in which babies with Down syndrome may be at risk, this doesn’t mean that your baby will have all or any of the conditions listed. Remember that each baby is an individual with a unique medical history. Because children with Down syndrome are generally shorter than typically developing children, Down Syndrome Growth Charts have been created by physicians and researchers to help track your child’s development. Both the Down Syndrome Health Care Guidelines and Growth Charts are available free of charge through the NDSS Web site or by calling our Information and Referral Center. For optimal health care, locate a developmental pediatrician, specialists knowledgeable about Down syndrome or a Down syndrome clinic if one is available near your home. These specialists can work with your primary care physician. Local parent groups are an excellent resource for learning of health care professionals who have experience with Down syndrome. 1) Is the therapy documented to be safe and effective? Ask for copies of current research studies that support the therapy’s claims. 2) Will the person promoting the therapy benefit from its use? Proponents may have financial interests in sales of the therapy. 3) Is the therapy expensive or overly demanding of the new family’s time? 4) What are the risks or side effects? Most therapies have both effects and side effects. These side effects should be weighed against the benefits. Your child is entitled to intervention and education that will assist in maximizing his or her potential. Early intervention should begin as soon as possible after birth and should be targeted to your child’s needs. Early intervention may include physical, speech and occupational therapy. The evaluation to determine whether your child is eligible for early intervention is free of charge if performed by a state-authorized service provider. Check with your state’s early intervention center for these providers. No child may be denied services based on ability to pay, but each state has its own process to administer these services. A complete listing of early intervention centers by state is available on the NDSS Web site. Federal law PL 105-17, the Individuals with Disabilities Education Act (IDEA), mandates that local school districts provide free preschool services for children with disabilities starting at the age of three. A local parent group can help you access these services and, if necessary, advocate for your child’s needs. Inclusion has become more common in recent years, primarily because parents have advocated for it. Inclusion is beneficial to both the child with Down syndrome and the other students in the class. Learn your local school district’s educational philosophy and begin advocating for change if necessary. 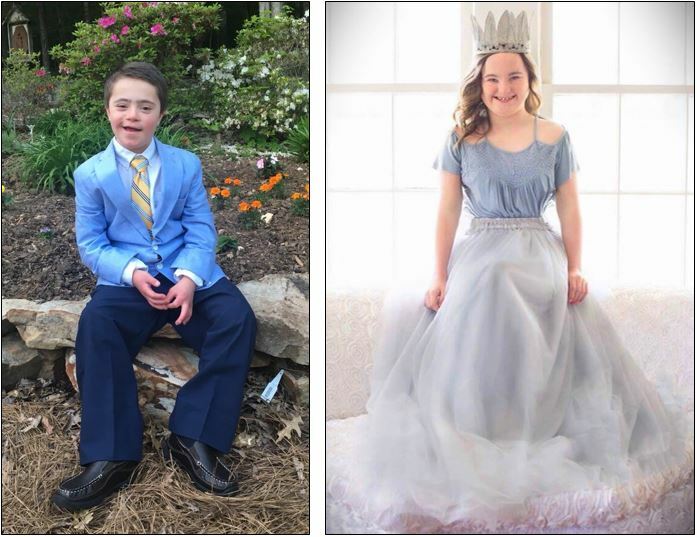 Inclusion should be an option for all students, but there is no “one-size-fits-all” approach to educating students with Down syndrome. When a child with Down syndrome is born, many people – from experts to family members – will tell you they “know” what your child will accomplish in life. While there are guidelines regarding physical and cognitive development, it is impossible to predict the future of a child with Down syndrome – just as it is for any other child. No professional can look at a child and tell you how intelligent, successful or independent he or she will be in 20, 30 or 50 years. Don’t lower your expectations because your baby has Down syndrome. You will never know what your child is capable of if you don’t give him or her the chance to succeed. Today, individuals with Down syndrome are achieving more than we ever thought possible – due in part to a higher expectations and more opportunities. They are living independently and semi-independently, working and volunteering in the community, graduating high school and attending post-secondary education programs. People with Down syndrome have meaningful relationships and some marry. Whether or not your child accomplishes these things, it is never wrong to challenge children to do their best. While it’s important to encourage children with Down syndrome to follow their dreams, remember to balance your positive expectations with reality. Avoid placing unrealistically high expectations on your child. Failure to meet parental expectations can negatively affect a child’s self-esteem. In any case, it is important to enjoy this time with your baby and celebrate each milestone as it happens. When a baby is born, especially one with Down syndrome, the family’s attention is often focused on its newest member. It will be difficult, but don’t lose sight of the needs of your spouse and other children. Build time into the day for each member of the family. All members of your family are special in their own way – not just your child with Down syndrome. Encourage your whole family to focus on the baby as an individual and a member of the family, not only on his or her diagnosis. Your child has been, or is about to be, born into a world of opportunities never before imagined for people with Down syndrome. NDSS has worked since 1979 to ensure that all people with Down syndrome have the opportunity to achieve their full potential. We have celebrated many advancements through the years, but there is still far to go. We envision a future in which your baby realizes dreams that today we cannot even imagine.